Most curries are off- limits when you follow a low calorie diet but there is a way to get your spicy kicks without boosting the calorie count too much. Try this delicious recipe for a fruity Keema curry which appeals to the whole family. Easy to prepare and adapt to personal preferences, it’s a tasty winner. Start by softening the chopped onion in low-fat oil spray. Add the cooking apple. Now add the curry powder, the amount and strength you add will depend on personal taste. If you are serving your curry as a family meal, stick to the mild version. Make sure you use curry powder rather than curry paste as the pastes often contain added oil. Fry the powder into the onions and apples for about a minute as this helps to intensify the flavour. Add the steak mince and fry until thoroughly browned. Pour the whole mixture into a colander to drain any fat from the meat. Pour the mixture back into the pan. Introduce the tin of mulligatawny soup into the curry. The soup makes an excellent base for the curry and has less than 200 calories per tin. Simmer the curry for around 45 minutes and 10 minutes before the end of the cooking time, sprinkle the sultanas into the sauce. Serve the curry on a small bed of plain, boiled rice. The recipe can be adapted by substituting the minced beef for chopped chicken breast and using chicken mulligatawny soup as the base for the sauce. The calorie count will be even lower if you use chicken instead of beef. For a vegetarian version, start the curry by frying some of your favourite vegetables together in low-fat oil spray. Good choices include mushroom, aubergine, courgettes and peppers. While the vegetables are softening, add enough curry powder to suit your taste. Instead of mulligatawny soup, use tinned tomatoes as your sauce base. Simmer the curry until all the vegetables are tender and cooked through. If you want to add a little creaminess to the finish curry, finish it by swirling through a tablespoon of low fat yogurt or low fat crème fraiche. Most of the calories in curry come from cream. You can still add an extra touch of richness to low calorie curries. Roast half a butternut squash until golden brown. This should take about half an hour in a medium hot oven. Puree the squash so it’s smooth and creamy. 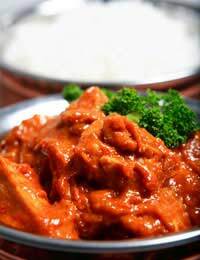 Add the puree to your curry dish towards the end of the cooking time and blend it with the sauce thoroughly. Raita is a yoghurt based condiment traditionally served with curry. Make your own version by mixing low-fat plain yoghurt with chunks of chopped cucumber which has been peeled and de-seeded. Finish the raita with fresh mint. Pilau rice certainly accounts for a lot of calories. Keep your counts low by using plain, boiled basmati rice. To give it an authentic and appealing colour, add a small amount of turmeric to the rice while it’s boiling. Low calorie eating doesn’t rule out the delights of curry. Making some careful changes ensures you always have a tasty, spicy treat to enjoy.